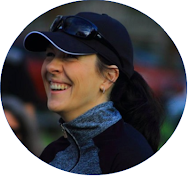 I've been on a quest to find natural ways to fuel on the run for, well, years now. Will says I'm weird, but I just cannot stand the thought of swallowing a chemically manufactured gel or potion with a string of ingredients as long as my forearm, most of which I can't even pronounce. Not for me, thanks. And by "natural ways" I don't mean going all hippie and carrying a plastic bag full of date balls with me during long runs or races - I'm simply looking for something that is conveniently packaged, but still good for my health. A tall order, it seems: Natural, convenient fuelling options are about as common as..., well, they're not very common. 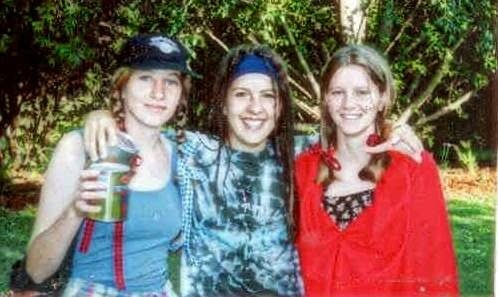 I did dress up as a hippie for our rag procession in 1996 (that's me in the middle)... But I didn't carry any date balls then either. I've only done one full marathon to date, and its fuelling stations were right up my alley. I seriously wanted to burst out in song when I saw what was on offer at the Paris Marathon in 2011: Raisins and cut oranges! (There were some other stuff too, of course, but these two really stood out to me.) I carried my own fuel too, but munched on oranges and raisins in between and never hit the wall. It was perfect. Compliments of raisins and cut oranges. Fuelling requirements are, of course, less intense for half marathons (my favourite racing distance), but I do find that I need a little something (other than water) at 10, 15 and 20 kilometres to just give me some oomph. Sadly, carrying around raisins or oranges (or date balls) for a run or race just isn't convenient, so I've stuck to Vitrace tablets in the past. Something even more natural would be nice, though - any recommendations? I was lucky enough to win a whole box of Ener-B sachets online last week, and must say that I'm really excited to try them out during my half marathon training and potentially on race day too. Ener-B has only one ingredient: 100% raw honey. This is exactly what I've been looking for as far as natural, convenient fuelling goes, but I definitely have my doubts about ingesting something as (sickly) sweet as honey during a run (I don't have a sweet tooth at all)... I'm curious to see what it does in terms of performance, though, so I'm going to give it a try. I'll let you know how it goes! Honey on the run: Yay or nay? Do you prefer natural fuels? Any natural fuel recommendations? Yuck to gels...my one experience with one was awful and left me wondering how people stomach that stuff. I've heard about people using honey to fuel on the run, but haven't tried it myself. Let me know what you think when you try it! I did try Honey Stinger products because they're more natural. Didn't like their gel, but I did like their organic energy chews. I'll definitely let you know about the honey! I haven't seen the Honey Stinger chews here in SA yet - sounds like a good option. Will keep my eyes open! We also love honey and use it in our home quite often - will let you know how it is as a running fuel.